I was born in Utuado, Puerto Rico, in 1930. My family and I migrated to New York City in 1939 for reasons unknown to me. My background is not unusual for a Puerto Rican immigrant. We were quite poor, always struggling to make ends meet, living in apartments with no hot water or refrigerators, with no heat in the winter and rats in the hallways. I was never going to be a Boy Scout, for the uniform cost $14. My first bed was a necessity of my marriage, for which I bought my first suit. I went through the public school system, where my name was immediately changed. I thought this was a good thing at the time, for everyone told me we had to act like Americans. I tried college, found it not to my liking (my chemistry professor bluntly told me that I "would not make it"). I joined the Air Force, and in 1952 married Marilyn. We proceeded to raise a family of three: Lisa, Jason and Martín, all independent, progressive, creative and outspoken, and all quite different. Photography became an important element in my life early on. I attended The New York Institute of Photography in New York City on the GI Bill, where I learned that I was not going to be a commercial photographer that I would forever stay away from formal education. But I was encouraged by one of my instructors to follow my first love, documentary photography, which I have pursued diligently all my life. I was fortunate to have some of the greatest role models to emulate: Gene Smith, with whom I studied; and Dave Heath, a friend and teacher, being the most influential. Having to support a family, I went to work for an electrical contractor, a job I despised for all of ten years. 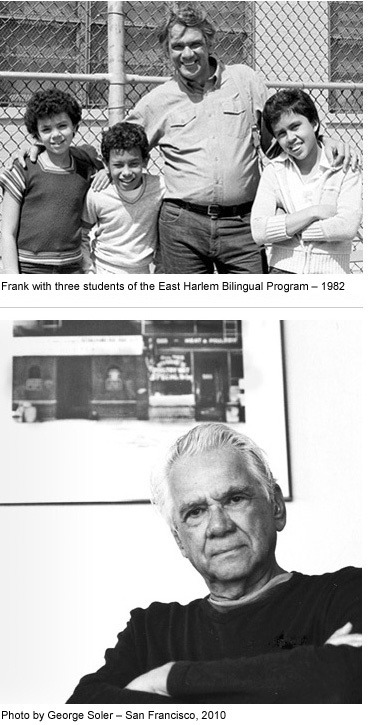 It was around this time that I became involved in the Civil Rights movement, then in its infancy, and went to work in 1967 for a community action program, the Puerto Rican Community Development Project (PRCDP), directed by my good friend Manny Díaz. The story goes on, but in retrospect I can say that I believe it was all a bloody waste of my creative years. Although I documented some aspects of the struggle, I was too busy being an organizer and "leader" to think of much else. So much for that. In 1979, in my 49th year, I finally got the opportunity to realize my life-long dream of shooting a major documentary, when I came up with the idea for a project on the Puerto Rican Diaspora. This book is one of the results of that endeavor. Another is the enormous effect it has had on my life, all positive and rewarding. It was rather late in life that I discovered I love to teach, which has resulted in eighteen of the best years of my life, after moving to San Francisco in 1985. I have Michael Lesser to thank for giving me the opportunity to teach at the UC Berkeley Extension Program in San Francisco. Finally, when asked about the single worst thing that has ever happened to me, I cite the fact that I was brought to this country, where I found I was not good enough to be what I was. Then I quickly add: But the best thing that has ever happened to me is finding my wife of 60 years, whom I never would have met had I not left the island. Así son las cosas de la vida.